This article is about the geographical region. For the province of Pakistan, see Punjab, Pakistan. For the state of India, see Punjab, India. For other uses, see Punjab (disambiguation). 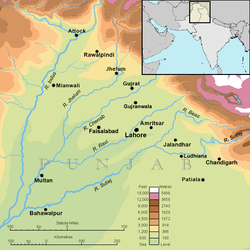 The Punjab (/pʌnˈdʒɑːb/ ( listen), /-ˈdʒæb/, /ˈpʌndʒɑːb/, /-dʒæb/), also spelled Panjab (from Persian panj, "five" + āb, "water" or "river", thus land of "five rivers";), is a geopolitical, cultural and historical region in South Asia, specifically in the northern part of the Indian subcontinent, comprising areas of eastern Pakistan and northern India. The boundaries of the region are ill-defined and focus on historical accounts. Until the Partition of Punjab in 1947, the British Punjab Province encompassed the present-day Indian states and union territories of Punjab, Haryana, Himachal Pradesh, Chandigarh, and Delhi; and the Pakistani provinces of Punjab and Islamabad Capital Territory. It bordered the Balochistan and Pashtunistan regions to the west, Kashmir to the north, the Hindi Belt to the east, and Rajasthan and Sindh to the south. The people of the Punjab today are called Panjabis, and their principal language is Punjabi. The main religions of the Indian Punjab region are Sikhism and Hinduism. The main religions of the Pakistani Punjab region is Islam. Other religious groups are Christianity, Jainism, Zoroastrianism, Buddhism, and Ravidassia. The Punjab region has been inhabited by the Indus Valley Civilisation, Indo-Aryan peoples, and Indo-Scythians, and has seen numerous invasions by the Persians, Greeks, Kushans, Ghaznavids, Timurids, Mughals, Pashtuns, British, and others. Historic foreign invasions mainly targeted the most productive central region of the Punjab known as the Majha region, which is also the bedrock of Punjabi culture and traditions. The Punjab region is often referred to as the breadbasket in both India and Pakistan. The region was originally called Sapta Sindhu, the Vedic land of the seven rivers flowing into the ocean. The origin of the word Punjab can probably be traced to the Sanskrit "pancha-nada" (IAST: panca-nada), which literally means "five rivers", and is used as the name of a region in the Mahabharata. The later name of the region, Punjab, is a compound of two Persian words, Panj (five) and āb (water), introduced to the region by the Turko-Persian conquerors of India, and more formally popularised during the Mughal Empire. Punjab thus means "The Land of Five Waters", referring to the rivers Jhelum, Chenab, Ravi, Sutlej, and Beas. All are tributaries of the Indus River, the Sutlej being the largest. The 1947 definition defines the Punjab region with reference to the dissolution of British India whereby the then British Punjab Province was partitioned between India and Pakistan. In Pakistan, the region now includes the Punjab province and Islamabad Capital Territory. In India, it includes the Punjab state, Chandigarh, Haryana, and Himachal Pradesh. Using the 1947 definition, the Punjab borders the Balochistan and Pashtunistan regions to the west, Kashmir to the north, the Hindi Belt to the east, and Rajasthan and Sindh to the south. Accordingly, the Punjab region is very diverse and stretches from the hills of the Kangra Valley to the plains and to the Cholistan Desert. The older definition of the Punjab region focuses on the collapse of the Sikh Empire and the creation of the British Punjab province between 1846 and 1849. According to this definition, the Punjab region incorporates, in Pakistan, Azad Kashmir including Bhimber and Mirpur and parts of Khyber Pakhtunkhwa (especially Peshawar known in the Punjab region as Pishore). In India the wider definition includes parts of Delhi and Jammu Division. the semi-desert to the south of the Sutlej river. The formation of the Himalayan Range of mountains to the east and north-east of the Punjab is the result of a collision between the north-moving Indo-Australian Plate and the Eurasian Plate. The plates are still moving together, and the Himalayas are rising by about 5 millimetres (0.2 in) per year. The upper regions are snow-covered the whole year. Lower ranges of hills run parallel to the mountains. The Lower Himalayan Range runs from north of Rawalpindi through Jammu and Kashmir, Himachal Pradesh and further south. The mountains are relatively young, and are eroding rapidly. The Indus and the five rivers of the Punjab have their sources in the mountain range and carry loam, minerals and silt down to the rich alluvial plains, which consequently are very fertile. The third definition of the Punjab region adds to the definitions cited above and includes parts of Rajasthan on linguistic lines and takes into consideration the location of the Punjab rivers in ancient times. In particular, the Sri Ganganagar and Hanumangarh districts are included in the Punjab region. There are three main seasons and two transitional periods. During the hot season from mid-April to the end of June, the temperature may reach 49 °C (120 °F). The monsoon season, from July to September, is a period of heavy rainfall, providing water for crops in addition to the supply from canals and irrigation systems. The transitional period after the monsoon is cool and mild, leading to the winter season, when the temperature in January falls to 5 °C (41 °F) at night and 12 °C (54 °F) by day. During the transitional period from winter to the hot season, sudden hailstorms and heavy showers may occur, causing damage to crops. The epic battles described in the Mahabharata are described as being fought in what is now the State of Haryana and historic Punjab. The Gandharas, Kambojas, Trigartas, Andhra, Pauravas, Bahlikas (Bactrian settlers of the Punjab), Yaudheyas and others sided with the Kauravas in the great battle fought at Kurukshetra. According to Dr Fauja Singh and Dr L. M. Joshi: "There is no doubt that the Kambojas, Daradas, Kaikayas, Andhra, Pauravas, Yaudheyas, Malavas, Saindhavas and Kurus had jointly contributed to the heroic tradition and composite culture of ancient Punjab". Menander I Soter (165/155 –130 BCE), conqueror of the Punjab, carved out a Greek kingdom in the Punjab and ruled the Punjab until his death in 130 BC. In 711–713 CE, the 18-year-old Arab general Muhammad bin Qasim of Taif, a city in what is now Saudi Arabia, came by way of the Arabian Sea with Arab troops to defeat Raja Dahir. Bin Qasim then led his troops to conquer the Sindh and Punjab regions for the Islamic Umayyad Caliphate, making him the first to bring Islam to the region. During the establishment and consolidation of the Muslim Turkic Mughal Empire prosperity, growth, and relative peace were established, particularly under the reign of Jahangir. Muslim empires ruled the Punjab for approximately 1,000 years. The period was also notable for the emergence of Guru Nanak (1469–1539), the founder of Sikhism. In 1758, Punjab came under the rule of Marathas, who captured the region by defeating the Afghan forces of Ahmad Shah Abdali. Abdali's Indian invasion weakened the Maratha influence, but he could not defeat the Sikhs. After the death of Ahmad Shah, the Punjab was freed from the Afghan yoke by Sikhs between 1773 and 1818. At the time of the formation of the Dal Khalsa in 1748 at Amritsar, the Punjab had been divided into 36 areas and 12 separate Sikh principalities, called misl. From this point onward, the beginnings of a Punjabi Sikh Empire emerged. Out of the 36 areas, 22 were united by Maharaja Ranjit Singh. The other 14 accepted British sovereignty. After Ranjit Singh's death, assassinations and internal divisions severely weakened the empire. Six years later the British East India Company was given an excuse to declare war, and in 1849, after two Anglo-Sikh wars, the Punjab was annexed by the British. In the Indian Rebellion of 1857 the Sikh rulers backed the East India Company, providing troops and support, but in Jhelum 35 British soldiers of HM XXIV regiment were killed by the local resistance, and in Ludhiana a rebellion was crushed with the assistance of the Punjab chiefs of Nabha and Malerkotla. The British Raj had political, cultural, philosophical, and literary consequences in the Punjab, including the establishment of a new system of education. During the independence movement, many Punjabis played a significant role, including Madan Lal Dhingra, Sukhdev Thapar, Ajit Singh Sandhu, Bhagat Singh, Udham Singh, Kartar Singh Sarabha, Bhai Parmanand, Muhammad Iqbal, Chaudhary Rehmat Ali, and Lala Lajpat Rai. 1761: The Third Battle of Panipat, between the Durrani Empire against the Maratha Empire. Ethnic ancestries of modern Punjabis include a mixture of Indo-Aryan and Indo-Scythian. Semitic ancestries can also be found in lesser numbers. With the advent of Islam, settlers from Turkestan, Afghanistan, and Kashmir have also integrated into the Muslim Punjabi society. However, the majority of Punjab is still made up of the Arains, Dalits, Gujjars, Jats, Khatris, Tarkhans, Brahmins, Bhats, Awans, Kambojs, Rajputs Sainis, Kumhars, and others. [citation needed] In the past, the most densely populated area has been the Majha region of Punjab. The major language spoken in the Punjab is Punjabi. In the Indian Punjab this is written in the Gurmukhi script. Pakistan uses the Shahmukhi script, that is closer to Urdu script. Hindi, written in the Devanagri script, is used widely in the Indian states of Himanchal Pradesh and Haryana. Several dialects of Punjabi are spoken in the different regions. The Majhi dialect is considered to be textbook Punjabi and is shared by both countries. The vast majority of Pakistani Punjabis are Sunni Muslim by faith, but also include large minority faiths mostly Shia Muslim, Ahmadi Muslim and Christians. Sikhism, founded by Guru Nanak is the main religion practised in the post-1966 Indian Punjab state. About 57.7% of the population of Punjab state is Sikh, 38.5% is Hindu, and the rest are Muslims, Christians, and Jains. Punjab state contains the holy Sikh cities of Amritsar, Anandpur Sahib, Tarn Taran Sahib, Fatehgarh Sahib and Chamkaur Sahib. The Indian states of Haryana and Himachal Pradesh are mostly Hindu-majority. The Punjab was home to several Sufi saints, and Sufism is well established in the region. Also, Kirpal Singh revered the Sikh Gurus as saints. ^ a b c H K Manmohan Siṅgh. "The Punjab". The Encyclopedia of Sikhism, Editor-in-Chief Harbans Singh. Punjabi University, Patiala. Archived from the original on 5 March 2016. Retrieved 18 August 2015. ^ "Punjab, bread basket of India, hungers for change". Reuters. 30 January 2012. ^ "Columbia Water Center Released New Whitepaper: "Restoring Groundwater in Punjab, India's Breadbasket" – Columbia Water Center". Water.columbia.edu. 7 March 2012. Retrieved 12 July 2013. ^ "Pakistan flood: Sindh braces as water envelops southern Punjab". Guardian. 6 August 2010. Retrieved 20 July 2013. ^ D. R. Bhandarkar, 1989, Some Aspects of Ancient Indian Culture: Sir WIlliam Meyers Lectures, 1938–39, Asia Educational Services, p. 2. ^ Kenneth Pletcher, ed. (2010). The Geography of India: Sacred and Historic Places. Britannica Educational Publishing. p. 199. ISBN 978-1-61530-202-4. The word's origin can perhaps be traced to panca nada, Sanskrit for “five rivers” and the name of a region mentioned in the ancient epic the Mahabharata. ^ Rajesh Bala (2005). "Foreign Invasions and their Effect on Punjab". In Sukhdial Singh (ed.). Punjab History Conference, Thirty-seventh Session, March 18-20, 2005: Proceedings. Punjabi University. p. 80. ISBN 978-81-7380-990-3. The word Punjab is a compound of two words-Panj (Five) and aab (Water), thus signifying the land of five watrers or rivers. This origin can perhaps be traced to panch nada, Sanskrit for 'Five rivers' the word used before the advent of Muslims with a knowledge of Persian to describe the meeting point of the Jhelum, Chenab, Ravi, Beas, and Sutlej rivers, before they joined the Indus. ^ Latif, Syad Muhammad (1891). History of the Panjáb from the Remotest Antiquity to the Present Time. Calcultta Central Press Company. p. 1. The Panjáb, the Pentapotamia of the Greek historians, the north-western region of the empire of Hindostán, derives its name from two Persian words, panj (five), an áb (water, having reference to the five rivers which confer on the country its distinguishing features." ^ Darpan, Pratiyogita (1 October 2009). "Pratiyogita Darpan". Pratiyogita Darpan. Archived from the original on 20 September 2016 – via Google Books. ^ Changes in the Socio-economic Structures in Rural North-West Pakistan By Mohammad Asif Khan  Archived 14 April 2016 at the Wayback Machine Peshawar was separated from Punjab Province in 1901. ^ Nadiem, Ihsan H. (2007). Peshawar: heritage, history, monuments. Sang-e-Meel Publications. Archived from the original on 16 October 2015. Retrieved 13 September 2015. ^ "Jammu and Kashmir". Encyclopædia Britannica. Archived from the original on 10 March 2016. ^ "Epilogue, Vol 4, Issue 11". Archived from the original on 4 February 2016. ^ Pritam Singh Gill (1978). History of Sikh nation: foundation, assassination, resurrection. University of Michigan. : New Academic Pub. Co. p. 380. ^ G. S. Gosal. "Physical Geography of the Punjab" (PDF). University of California, Santa Barbara. Archived (PDF) from the original on 8 June 2012. Retrieved 3 November 2012. ^ The Times Atlas of the World, Concise Edition. London: Times Books. 1995. p. 36. ISBN 0 7230 0718 7. ^ Grewal, J S (2004). Historical Geography of the Punjab (PDF). Punjab Research Group, Volume 11, No 1. Journal of Punjab Studies. pp. 4, 7, 11. Archived (PDF) from the original on 3 December 2012. ^ Balder Raj Nayat (1966). Minority Politics in the Punjab. Archived from the original on 5 February 2016. Retrieved 13 September 2015. ^ Ganda Singh (August 2004). "The Truth about the Indian Mutiny". Sikh Spectrum. Archived from the original on 20 May 2013. Retrieved 13 March 2013. ^ "Archived copy". Archived from the original on 8 February 2016. Retrieved 11 February 2016. CS1 maint: Archived copy as title (link). Daily Times (10 May 2012). Retrieved 12 July 2013. ^ "Census Reference Tables, C-Series Population by religious communities". Census of India. 2001. Archived from the original on 1 July 2010. Retrieved 25 July 2010. ^ "Sufi Saints of the Punjab". Punjabics.com. Archived from the original on 30 December 2013. Retrieved 1 July 2018. ^ Kirpal Singh, Sant. "The Punjab – Home of Master Saints". Archived from the original on 24 September 2015. Retrieved 1 July 2018. ^ Gopal Krishan. "Demography of the Punjab (1849–1947)" (PDF). Archived (PDF) from the original on 24 September 2015. Retrieved 15 October 2015. ^ "Population by religion community – 2011". Census of India, 2011. The Registrar General & Census Commissioner, India. Archived from the original on 25 August 2015. ^ "Punjab second richest state in country: CII", The Times of India, 8 April 2004. ^ Pakistani government statistics Archived 8 March 2007 at the Wayback Machine. Retrieved 14 April 2007. Narang, K.S. ; Gupta, Dr H.R. (1969). History of the Punjab 1500–1858 (PDF). U. C. Kapur & Sons, Delhi. Retrieved 22 January 2014. Sims, Holly. "The State and Agricultural Productivity: Continuity versus Change in the Indian and Pakistani Punjabs." Asian Survey, 1 April 1986, Vol. 26(4), pp. 483–500. Wikimedia Commons has media related to Punjab region. Wikisource has the text of the 1911 Encyclopædia Britannica article Punjab.